The CSR interventions of Tata Motors extend beyond the boundaries of India. In partnership with reputed NGOs and our distributor partners in various countries, we continue to work to support marginalised communities. The Tata Motors SkillPro programme was launched by our International Business division to train talented youth in several countries. Our distributor partners in these countries help us in identifying underprivileged youth with potential. We provide them with a nine-month mechanic motor vehicle training at our Jamshedpur Training Centre. Thereafter, the youngsters undergo on-the-job training in their respective countries at our channel partners' workshops. During 2016-17, we trained 22 youth, including two women participants, from 8 countries – Bangladesh, Mozambique, Sudan, Tanzania, Kenya, Nigeria, Ghana and Sri Lanka. All the 22 participants are now part of the distributor network and the Tata Motors extended family in their countries. At Tata Motors, every day is a learning process. 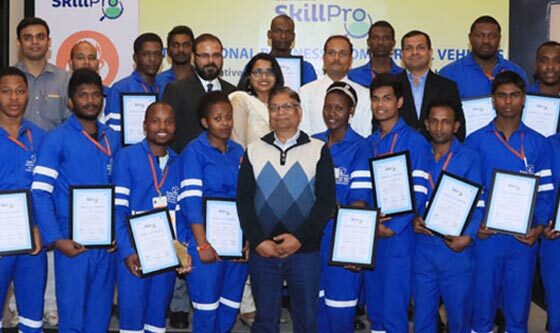 Tata Motors is boosting potential of underprivileged youth through the SkillPro programme. SkillPro is placing youth in the Tata Motors ecosystem.